Immuno and Inflammatory Diseases Centre for Drug Discovery, Glaxo Smith Kline, Stevenage, Herts, United Kingdom. NSAIDs reduce proinflammatory cytokine production in synovial cultures from CIA mice. Spontaneous TNF (A) and IL-6 (B) release from synovial membrane cultures from CIA mice in the presence of celecoxib (0.5–10 μM). Data shown are expressed as percent change in relation to vehicle-only–treated membranes and represents mean values ± SEM. Data were generated from two separate experiments. For each experiment, tissue was pooled from at least 10 separate animals. 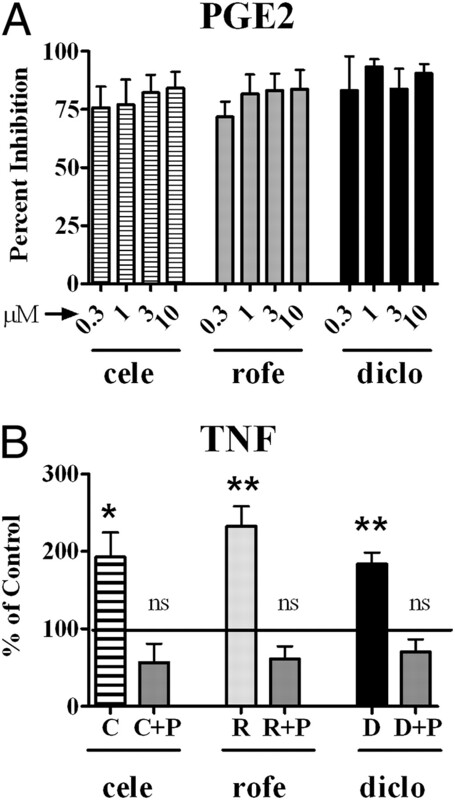 NSAIDs increase TNF expression in human RA synovial membrane cultures. A, Spontaneous TNF release by an RA synovial membrane culture from a single donor in the presence of NSAIDs (1–10,000 nM). Black bar represents vehicle control (DMSO) in the absence of NSAIDs. 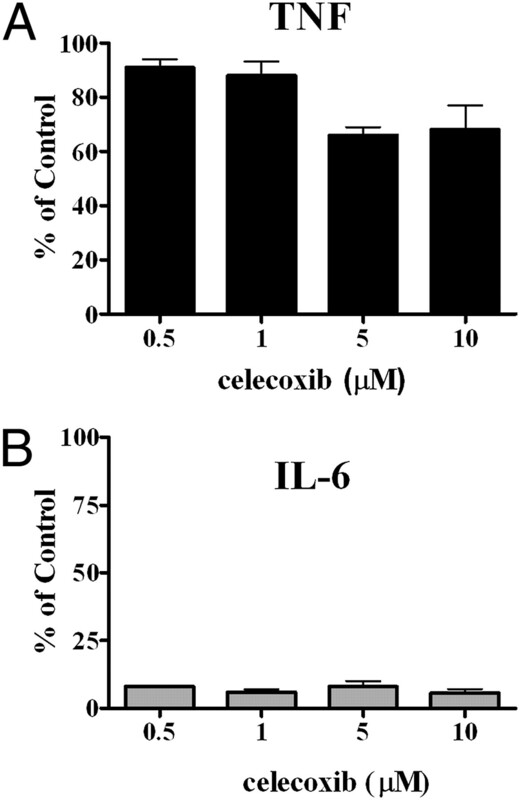 Spontaneous release of cytokines by RA synovial membrane cultures in the presence of clinically desirable concentrations (0.3–10 μM) of celecoxib (B), rofecoxib (C), and diclofenac (D). Data shown are expressed as percent change in relation to vehicle-only–treated membranes and represents mean values ± SEM from five to nine separate donors. The dashed line represents 100% control value (vehicle only). Statistical significance is shown for TNF at the 3.3 μM concentration. *p < 0.05; **p < 0.005; ***p ≤ 0.001. NSAID treatment increases TNF production in human monocytes. Primary human monocytes were stimulated for 24 h with LPS in the presence or absence of increasing concentrations of celecoxib (A), rofecoxib (B), or diclofenac (C). Tissue culture supernatants were examined for levels of TNF by ELISA. Tissue culture supernatants from five additional donors were treated with clinically desirable (0.3–10 μM) concentrations of celecoxib (D), rofecoxib (E), or diclofenac (F) and were also examined for levels of TNF, IL-6, IL-1, and IL-10 by ELISA. Results shown are expressed as increases relative to cells stimulated with LPS alone and represent mean values ± SEM. The dashed line represents 100% control value (LPS only). Statistical significance is indicated for TNF at the 3.3-μM concentration. t Tests for other cytokines were not significant. *p ≤ 0.05; **p ≤ 0.005. NSAIDs enhance TNF production in response to other TLR ligands. 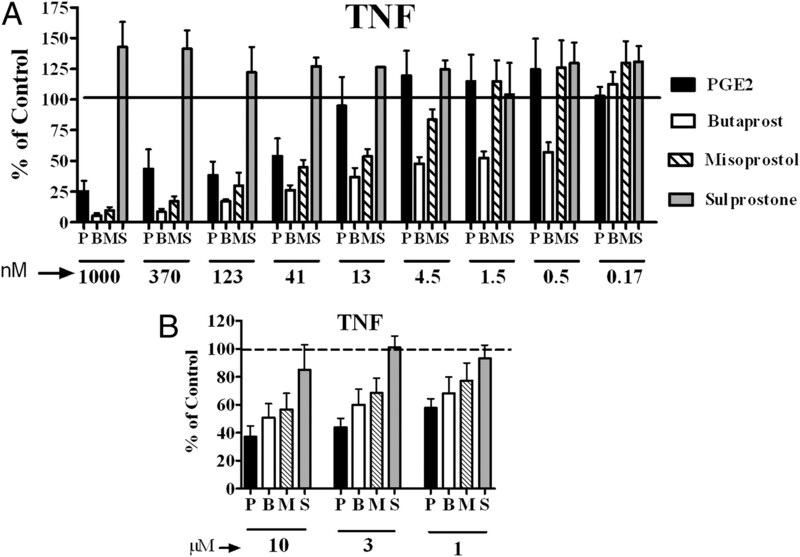 Primary human monocytes were stimulated with (A) PAM3Cys (10 ng/ml) or (B) flagellin (10 ng/ml) in the presence of 3.3 μM C, R, or D. Supernatants were harvested after 24 h, and TNF levels were measured by ELISA. Data shown represent mean values ± SEM from three or four separate donors. The dashed line represents 100% control value (TLR ligand only). *p ≤ 0.05; **p ≤ 0.005. C, celecoxib; D, diclofenac; R, rofecoxib. NSAID-induced changes in PGE2 mediate the changes observed in spontaneous TNF expression. A, RA synovial membrane cultures were incubated for 24 h with the indicated concentrations of NSAIDs. Supernatants were then analyzed by ELISA for PGE2 content. The graph shows percent inhibition when compared with untreated membranes. Data shown represent mean values ± SEM from three to six separate donors. B, Effect of addition of exogenous PGE2 (5 μM; +P) on TNF levels in NSAID-treated (10 μM) synovial membrane cultures. The graph shows percent changes relative to untreated membranes (solid line). Data shown represent mean values ± SEM from six or seven separate donors. cele, celecoxib; diclof, diclofenac; ns, no significant change; rofe, rofecoxib. *p ≤ 0.05; **p ≤ 0.005. Signaling via the EP2 receptor mimics PGE2-mediated changes in TNF. A, Primary human monocytes were stimulated with LPS (10 ng/ml) in the presence or absence of various concentrations of P, B, M, or S. After 24 h culture, supernatants were collected and levels of TNF were analyzed by ELISA. Data shown represent mean values ± SEM from three or four separate donors and represent percent change relative to diluent only (solid line). B, Human RA synovial membrane cultures were treated with 10, 3, or 1 μM P, B, M, or S. Spontaneous release of TNF was measured after 24 h by ELISA. Data shown are expressed as percent change in relation to diluent-only–treated membranes and represent mean values from four separate donors ± SEM. The dashed line represents 100% control value (diluent only). B, butaprost; M, misoprostol; P, PGE2; S, sulprostone. 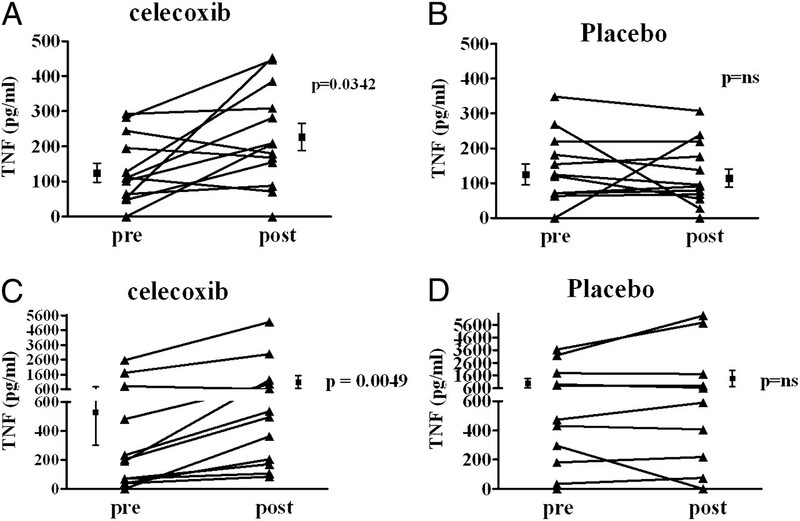 A single dose of celecoxib in vivo increases TLR-induced TNF production in whole blood. Healthy volunteers (aged 25–47 y) were given a single oral dose of either 200 mg celecoxib (A, C) or placebo (B, D). Whole blood was taken both before and 2 h after ingestion of drug or placebo and stimulated with 100 ng/nl LPS (A, B) or 10 μg/ml R848 (C, D). After 4 h culture, supernatants were harvested and examined for levels of TNF. Paired results (before and after) are shown for each individual volunteer. Statistical analysis was performed using the Wilcoxon signed rank test. ns, not significant.